I must have had a premonition that November would be tough because I made the full month of recipes as soon as they were announced. Which is lucky because since then we have had very little time for cooking. 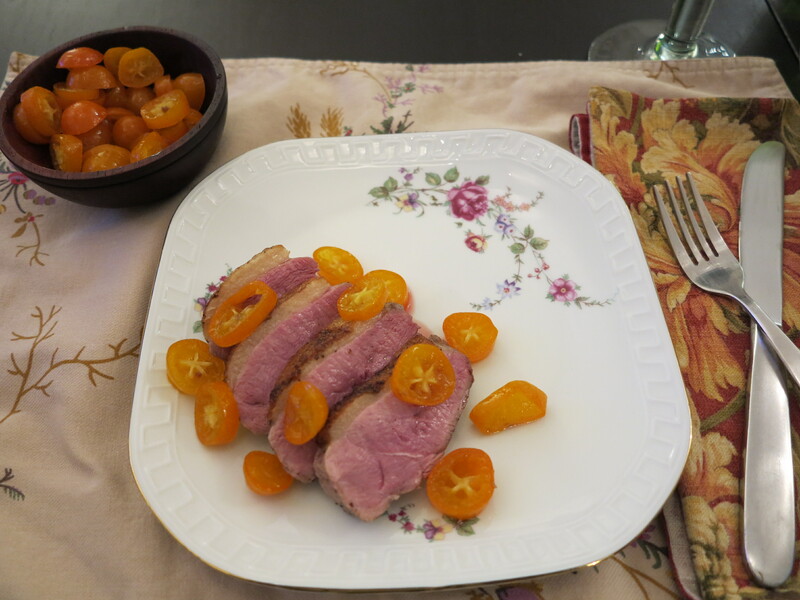 Dorie calls this week’s French Fridays with Dorie recipe, Pan-Seared Duck Breasts with Kumquats, a simpler version of duck a l’orange. I know that it’s an old classic, but somehow I’ve never actually had duck a l’orange. I think that by the time I had enough money to eat in the kinds of restaurants which would have served such fancy fare, the dish had been replaced. In this simpler version, Dorie has us candying sliced kumquats and serving them alongside the seared duck breasts with a balsamic reduction. To complete the orange theme, we paired the duck with an orange rice pilaf. The duck was perfectly cooked and the sauce was absolutely delicious. Husband approved! This entry was posted in french fridays with dorie and tagged Around my French Table, main course, poultry, seasonal - winter. Bookmark the permalink. I’ve never had duck a l’orange either. Your husband did a great job with the duck – it looks perfect. Ooh, that looks good. I haven’t seen kumquats yet. I was tempted to use some mandarin marmalade that I canned last year, but then I chickened out. It SOUNDS like the same general idea, but it could be totally horrid, so I didn’t do it. Love the idea of an orange pilaf with this! How wonderful to take a day off from cooking! I am glad everyone enjoyed the duck a l’orange. I cannot recall having Duck l’Orange either. Yes, I didn’t have much money for high-end restaurant excursions when I was younger as well. Since joining FFWD I have learned to cook duck well and now often order it when I’m at a nice restaurant. While the JarJarDuck wasn’t very satisfactory at all (I ended up eating an entire bag of caramel corn after dinner), all my other experiences have been good. I also think the duck with the peaches is my favorite and is also in the Top Five of FFWD favorites. I am glad you got this made and am glad you both enjoyed it. What a gorgeous plate and I love how the kumquats look like little jewels (I couldn’t find any, so I’m living vicariously). Still sending good thoughts for you and your family. oooh the orange rice pilaf is amazing, so I can’t say much about it except YUM!! I’m not a duck fan, but I do love kumquats 🙂 SO nice of your husband to cook for you! Your duck looks fabulous! Great job, husband!! I love the sound of the orange rice pilaf! This was a winner with my hubby too! Happy Friday, Rose! The first time that I ever had duck was when I bravely (stupidly) tried to make duck a l’orange from a Gourmet recipe. Fortunately, I hadn’t had duck cooked the right way yet so didn’t realize how over done it was – but it must have been good enough because I still love duck. Hope things are going better. Have a nice weekend. that fortunate. You are so lucky to have hubby cooking this, it’s nice to have a break. My husband approved this menu too and he is the duck expert in the house. It was my first meal of duck and I liked it. I hope your December is more calm.